If you ask people that have never been to Sweden what it’s like they will most likely say something about it being cold and having a lot of snow. A winter wonderland. Picturesque landscapes of cute red houses covered in a blanket of white snow. 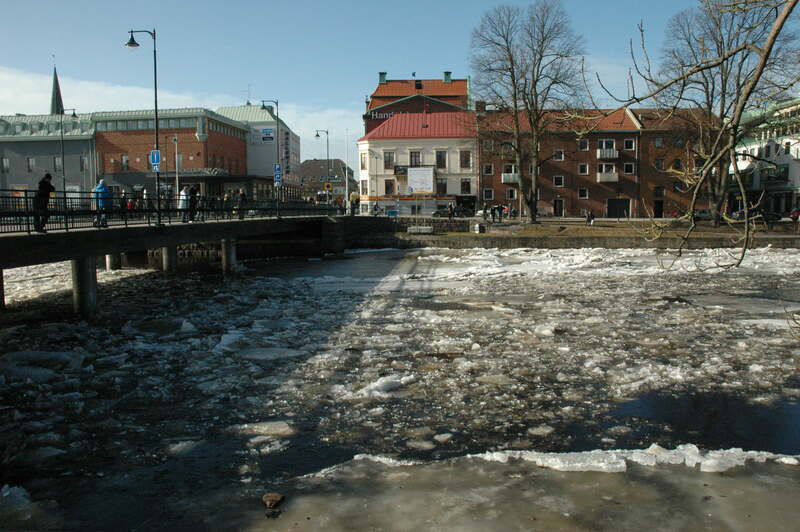 When I started visiting Sweden it was always in the winter and the one thing I wanted to do was go ice skating. 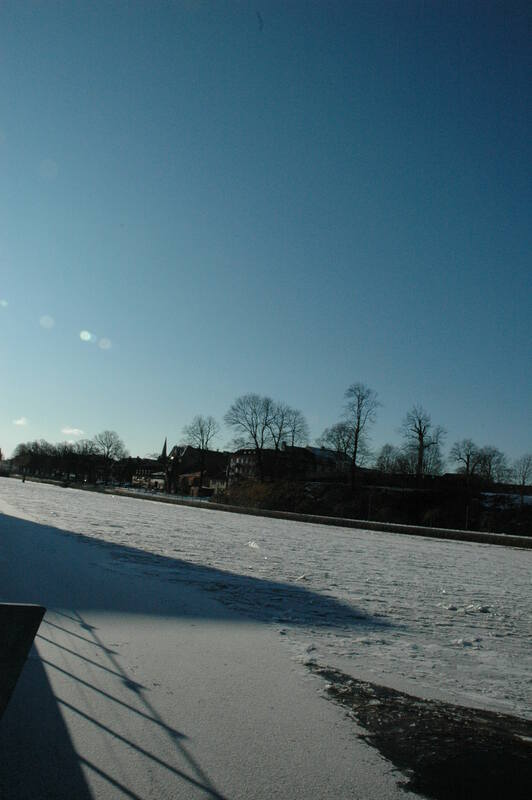 It would be so romantic and memorable: ‘I went ice skating on a frozen lake in Sweden with the love of my life’. 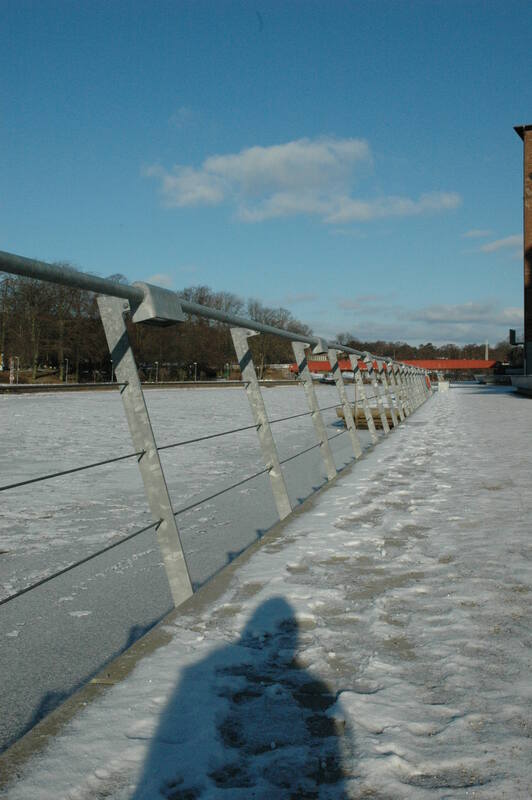 Upon spotting the first outdoor ice rink I saw on my first day in Gothenburg I excitedly asked my then-boyfriend-now-husband to skate with me, even if it wasn’t a lake (I was a little scared of that part anyway). Alas, it didn’t happen. And to this day, it still hasn’t. It couldn’t. Because of ice skates. Apparently it’s not easy to find a place that rents out ice skates in Sweden. It’s just not a thing – or at least not anymore. This boggled my mind because in New York you can rent ice skates no matter where you go. It’s almost like renting bowling shoes; if you go to a bowling ally to bowl, or if you go to skating rink to ice skate, a few bucks will get you the equipment you need. They aren’t always the most comfortable or beautiful looking skates and sometimes felt a bit dirty putting them on, but they are available. 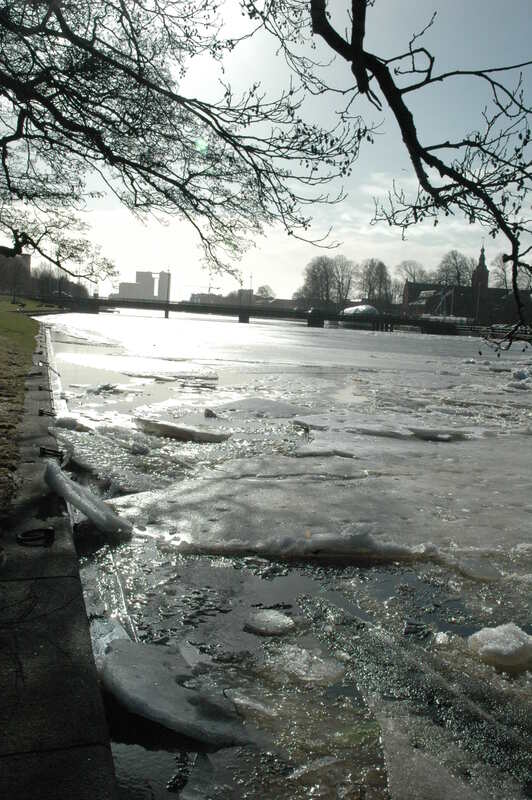 Not in Sweden – at least according to what people have told me and what I have seen (more so in Stockholm, if I understand correctly, although 4/6 on this website do not provide rentals: Ice skating in Stockholm). I have very fond memories of ice skating with friends and family at different (indoor and outdoor) rinks throughout New York. 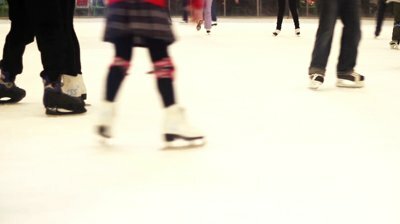 If someone is bored and looking for something fun and spontaneous to do with some friends “lets go ice skating” isn’t an option because someone would be left out (especially expats, most probably not having grown up having to own a pair of ice skates). What if someone doesn’t know how to skate and just wants to try something new without spending a ton of money? What about tourists? I had the option the buy custom made skates years ago and thought it would be a waste of money because ice skating is seasonal. And now that I’m in a country where that season is longer, I am regretting that decision. Of course there are cheaper options than buying brand new ice skates, if you are lucky enough to find your size at second hand shops like Amnesty, Röda Korset (The Red Cross) , Myrorna (Salvation army), or garage sales. I was reading the local paper today and an article about ice skates piqued my attention, reminding me that it might be something to write about. This article is about the exclusion of children on school trips that don’t have their own ice skates. Since ice rinks in Sweden no longer provide rental skates (Because of some missing equipment according to this article) there is no way for kids to participate in fun activities with their friends and classmates if their parents don’t have the money to buy them ice skates. The best the school can do is send out a letter asking parents of other students if they have extra skates for students that don’t have any. The man in the photo decided that this isn’t enough and kids should never be left out. 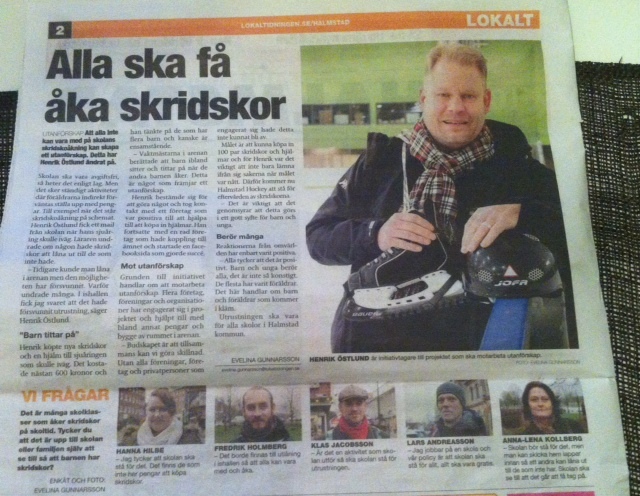 He set out do something about it and rallied up companies and private persons to provide ice skate and helmet rentals (to school kids only) in Halmstad once again. I think it’s a good start. Categories: Adjusting & Differences, Entertainment, Sweden | Tags: Ice skating, skridskor, Snow, Sweden, Winter | Permalink. 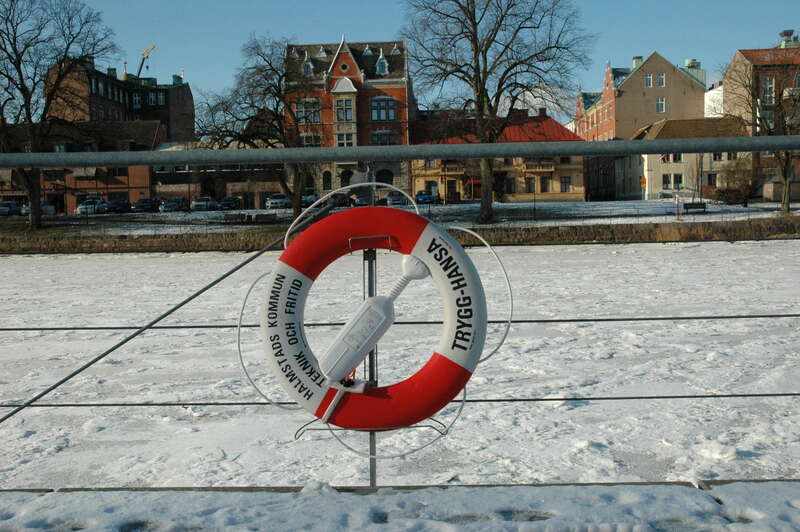 When many people (Read: Americans) think of Sweden they think of snow. And Polar Bears (Which there are none of). A snowy winter is how I know Sweden to be, not only because of that stereotype, but because I have spent all of my visits here during Christmas time. I’ve always loved snow, but I welcomed this snow with extra glee. It doesn’t snow nearly as much in the Southern tip of Sweden as in the rest of the country. Yesterday was my first “first snow” in Sweden, especially because I finally have something to compare “Snowy Sweden” to. The best part of the first snow early in December? Saying goodbye to Dreary Grey November. 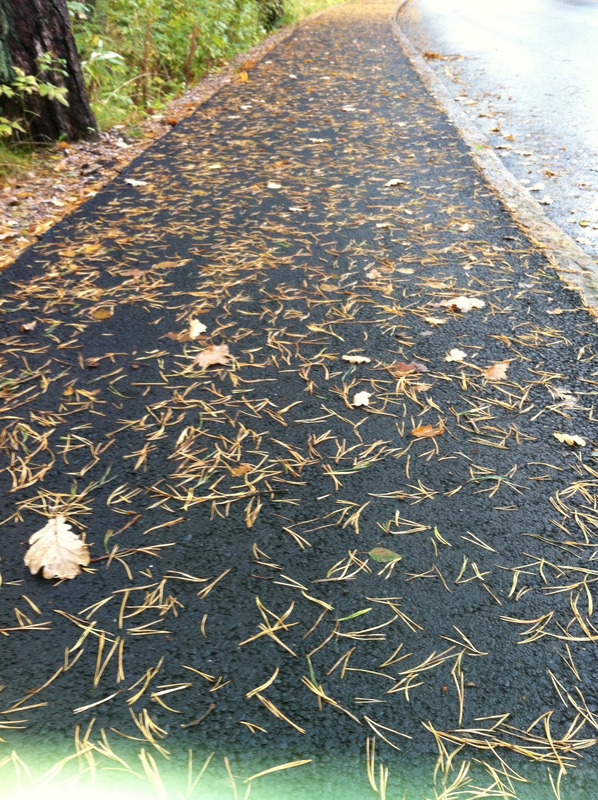 I’ve never experienced a Swedish November before, and I have to say it was the worst. On December 1st the sky finally opened up and revealed it’s blue self again, and then gave us snow to brighten our long nights as we hung decorations. This will be my forth Christmas in Sweden, but my first full winter. My visits were usually barely enough time to enjoy Christmas and New Years. I’ve never been here long enough to enjoy Christmas shopping, Christmas Markets, Lucia, or Advent. 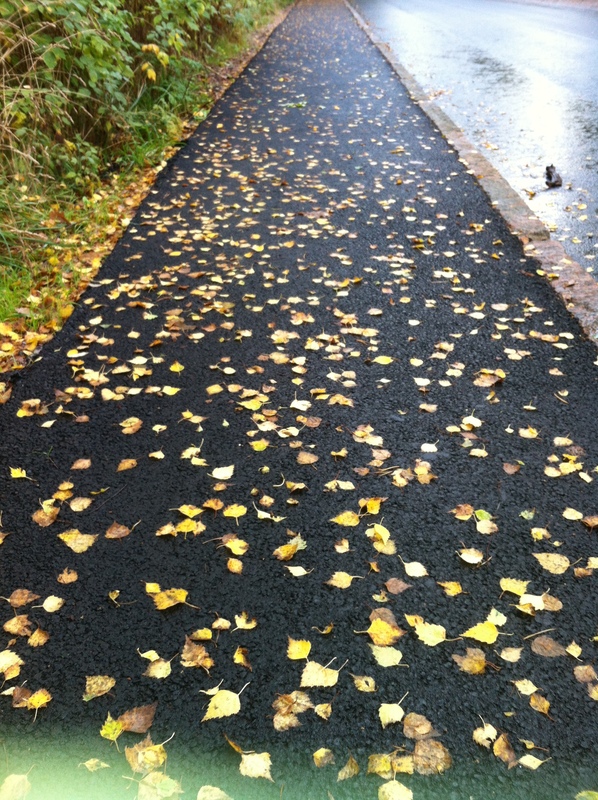 I was surprised to see so many cyclists out braving the weather. I could barely walk without falling. There are more tire tracks than footprints in the snow. An interesting difference that I find in Sweden is the lack of shoveling. As soon as the snow accumulates at all in NYC you hear the whole neighborhood shoveling as its still snowing. And then again an hour later, and early in the morning. The sidewalks are COMPLETELY shoveled. 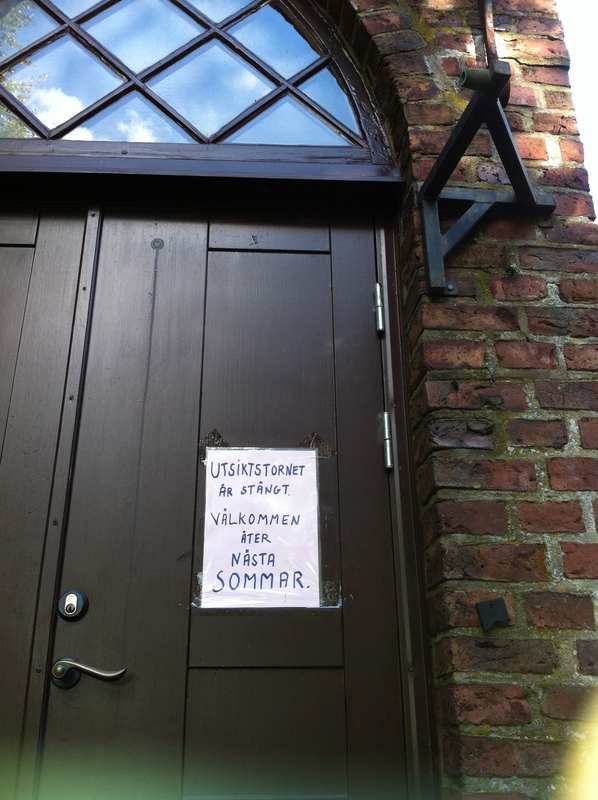 In Sweden – not so much. I didn’t see or hear a single shovel, nor see a shoveled sidewalk. Instead, we just walk on the bumpy and slippery snow and ice on our way to work and school and try not to fall down. I guess it is also a different mentality than “If someone falls on my property because I didn’t shovel they can sue me” which is pretty unlikely to happen in Sweden. 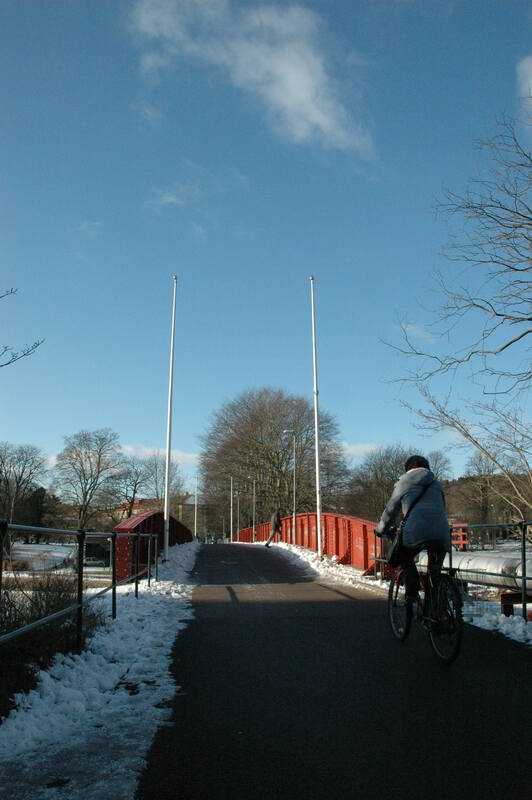 In Sweden, instead of using rock salt before it snows or right after, there is always a layer of gravel on the ground from December – April. I guess it gives traction and breaks up the snow a bit, but it doesn’t melt snow and ice like rock salt does. And it looks so messy for months! A snowman I found outside my apartment, and a soda can – perfect way of measuring snow! 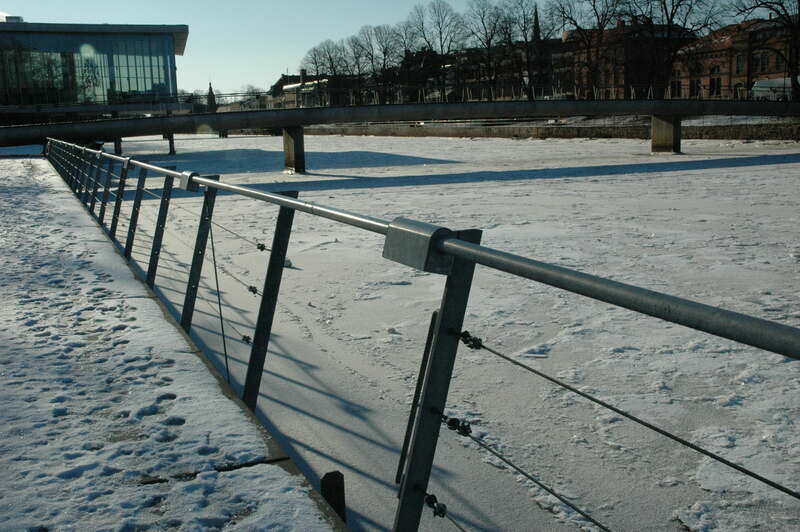 Categories: Halmstad, Photography, Sweden | Tags: holiday, Photography, season, Snow, Sweden, weather, Winter | Permalink. 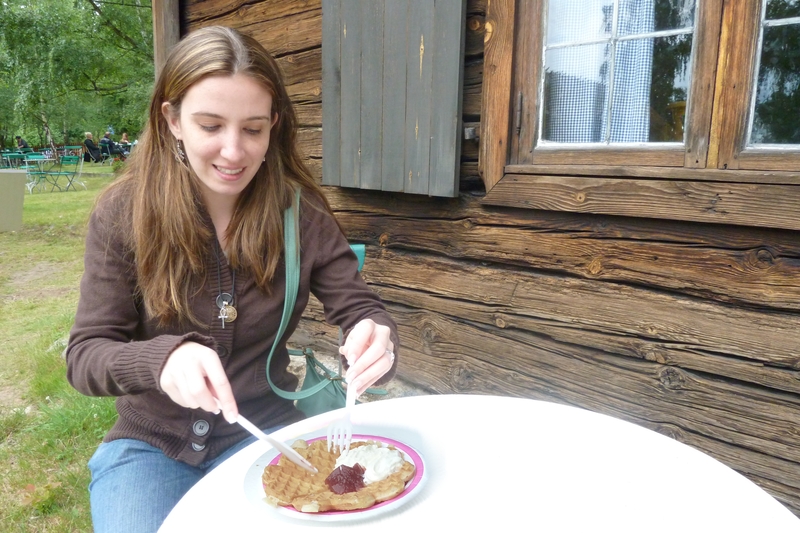 Now that I’ve been in Sweden for almost 10 months (wow!) 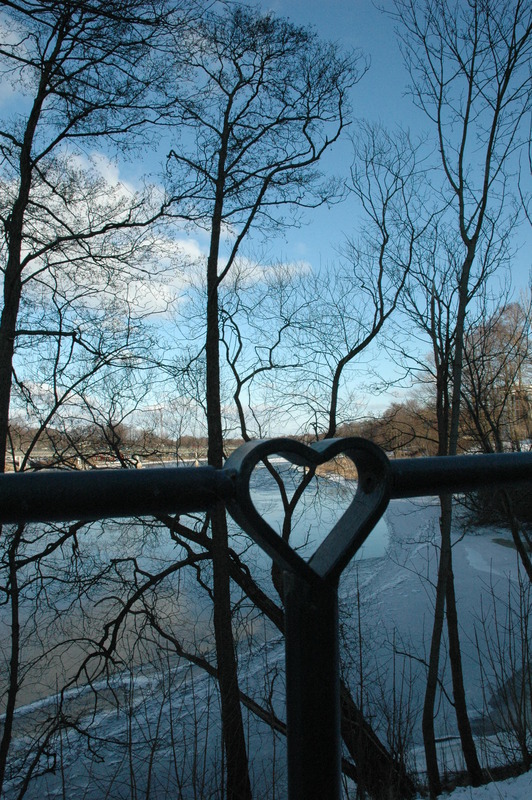 I’m getting to experience all the seasons in Sweden, and it has been a roller coaster! A very cloudy and rainy ride recently. 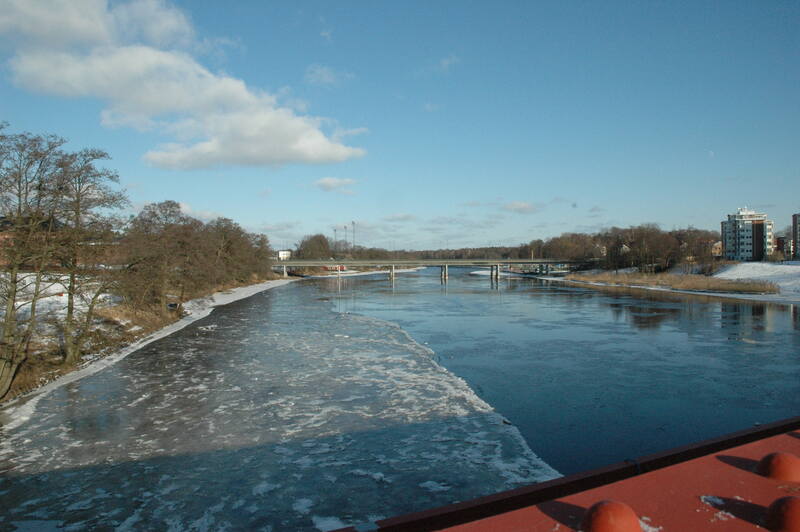 Southern Sweden is a comfortable mix of warm, but not too hot, summers, and cold, but not unbearably freezing, winters. Notice I only mentioned two seasons? Spring and Fall/Autumn come and go so quickly you can barely feel it in the air. But in fact this is only an estimate. 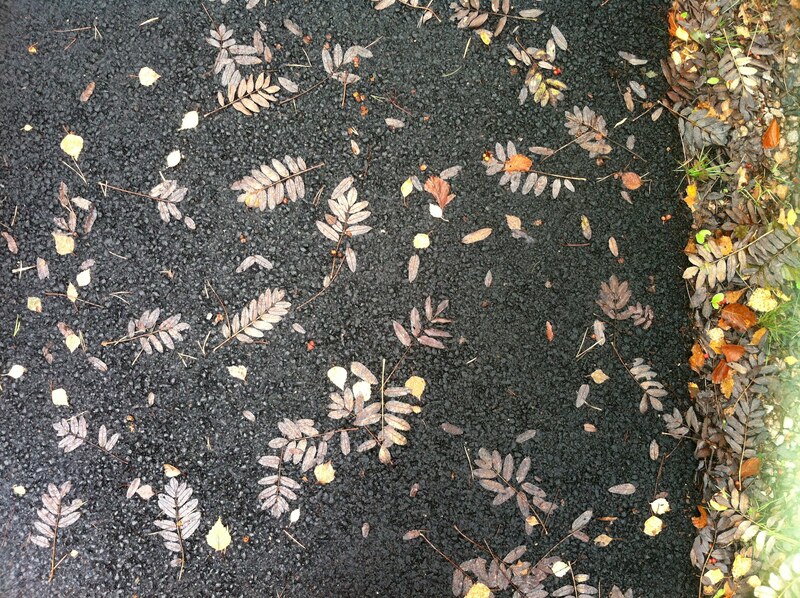 In Sweden there is no small talk about it officially being the first day of Fall. Not because the season is so brief, but because seasons are not noted on the Swedish calendar. You “feel” when a season arrives, you don’t “know” ahead of time. Just by looking at an American calendar I can tell you the dates of the seasons in 2012 are: March 20th, June 20th, Sept 22, and Dec 21st. In Sweden (and Finland) the seasons are determined according to a consistent 7-day temperature reading. Its Fall/Autumn because its been below +10°C (50°F) for long enough to consider the season change. 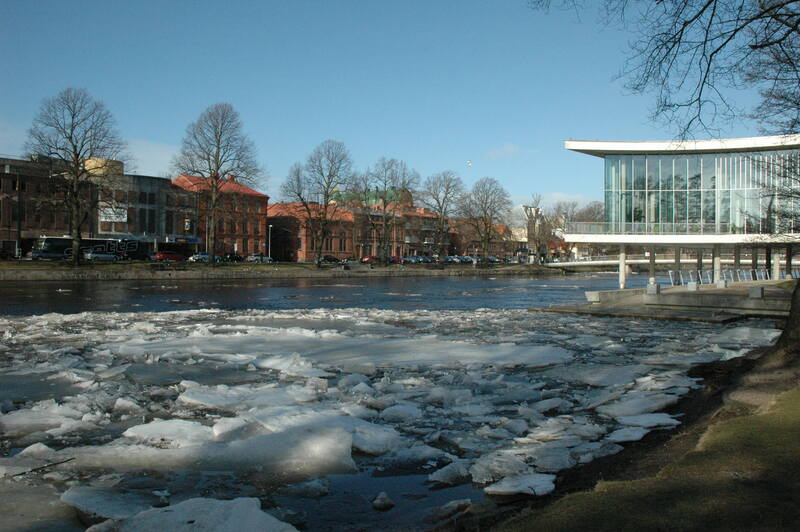 When will it be Winter in Sweden? When it’s cold enough 7 days in a row (Below 0°C/32°F). This means that the seasons change at a different times all throughout Sweden since there is such a huge climate difference in the North and South. 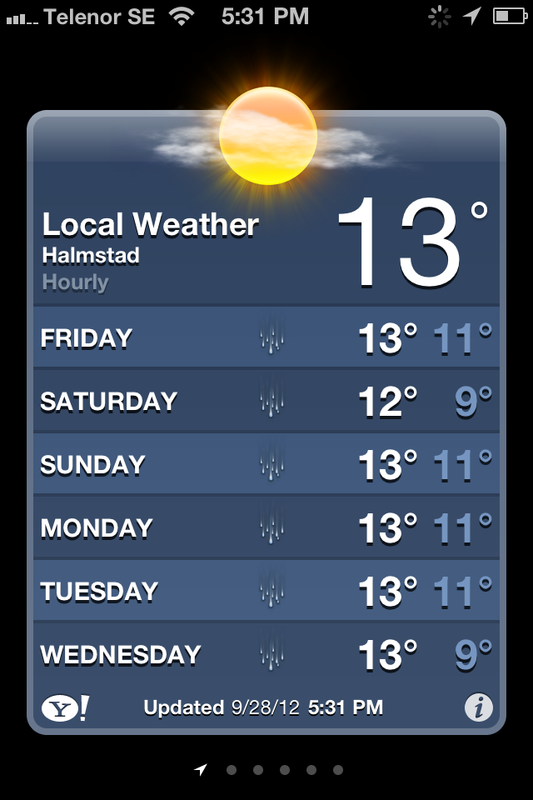 Before moving here I didn’t really think about Sweden having a lot of rain, just the stereotypical land of snow. For the past two weeks it has rained at least a little (usually a lot) everyday, with an overcast hiding any proof of sky or sun. I started wearing my light winter jacket and scarf this week, mostly because of the wind, but it reminded me that winter is coming and the days are getting shorter. Not that I wouldn’t mind the extra 15 degrees(F)/8 degrees (C) in NYC, but I think I’ve adjusted to the Swedish weather. I don’t mind the rain and cold as much and have gotten used to always carrying a sweater and umbrella all year round. Aside from the wind and rain it doesn’t feel like the temperature has dropped too drastically, but that’s because we had a chillier than normal summer. In fact, I read a newspaper article about Swedes needing to take extra D-vitamins to make up for the lack of sun this summer and that the sick season will come early. The hustle and bustle of tourists ended over a month ago, now the streets feel empty without all the outdoor dining and the sound of clanking plates and glasses. Buying gelato from the local ice cream truck. “The tower is closed. 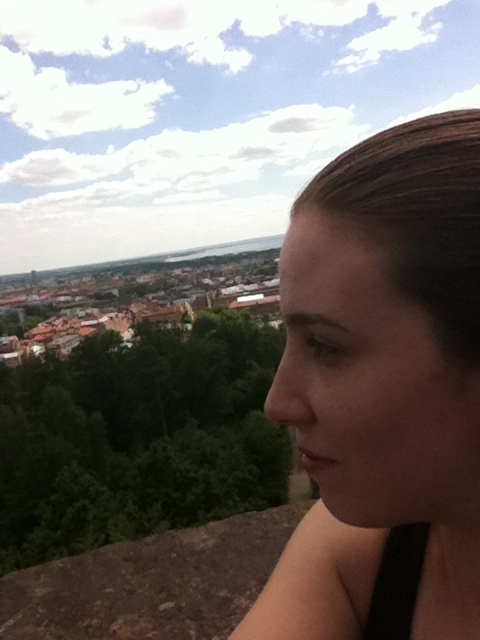 Welcome back next summer.” Looking over the town from above the trees. I’m determined to spend the next few weeks of good weather taking long walks before it becomes too cold and dark. After that I think I’ll be baking cookies. Something to look forward to! Categories: Adjusting & Differences, American in Sweden, Photography, Sweden | Tags: autumn, årstider, calendar, fall, seasons, Summer, Swedish weather, weather, Winter | Permalink. 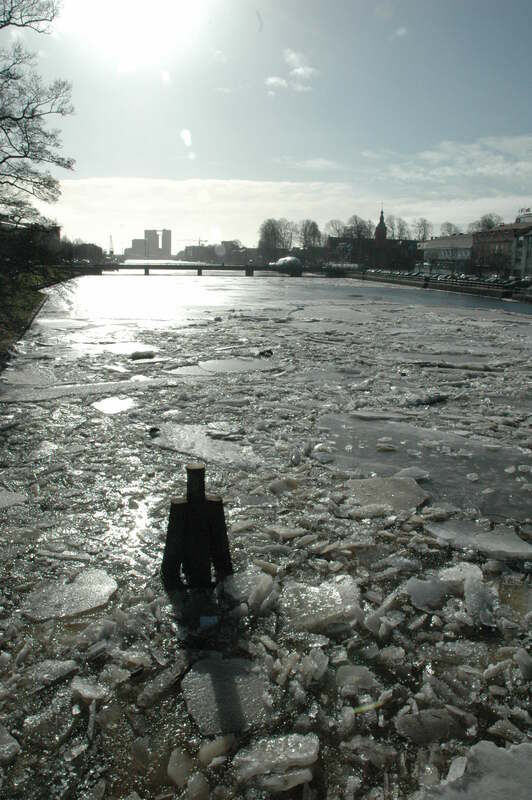 When I first moved to Sweden people thought I was crazy for arriving in the middle of winter. They are even more surprised to learn that over the past three years almost all my visits have been in the dead of winter, and I still wanted to move here! 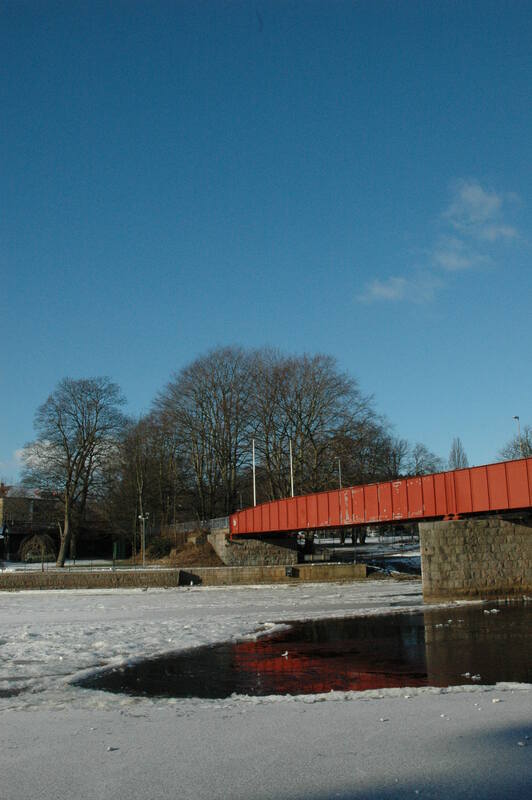 Sweden is known for its harsh weather- lots of snow, wind, freezing temperatures, and 17 hours of darkness during those winter months (November – March). 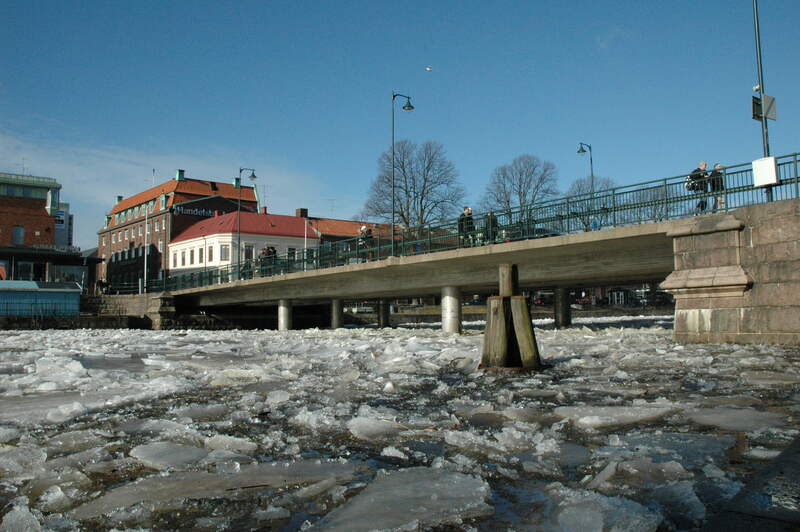 The climate between Southern and Northern Sweden is severe. Where the January temperatures in our town usually bottom out around -4 C (25F), that is nothing compared to Middle/Northern Sweden where Winter temperatures hit -15 C (5F). Our 17 hours of darkness is nothing compared to the 20+ hours of night the further North you travel. Thankfully our Southern weather is not as drastic: less snow, more light, less frigid, but more wind. 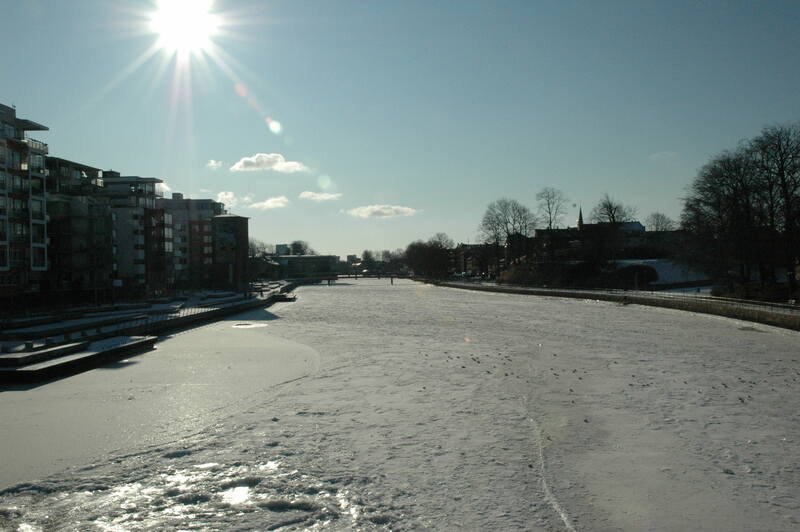 The winter months affects all Swedes though, and everyone looks forward to summer days filled with sunshine and warmth. 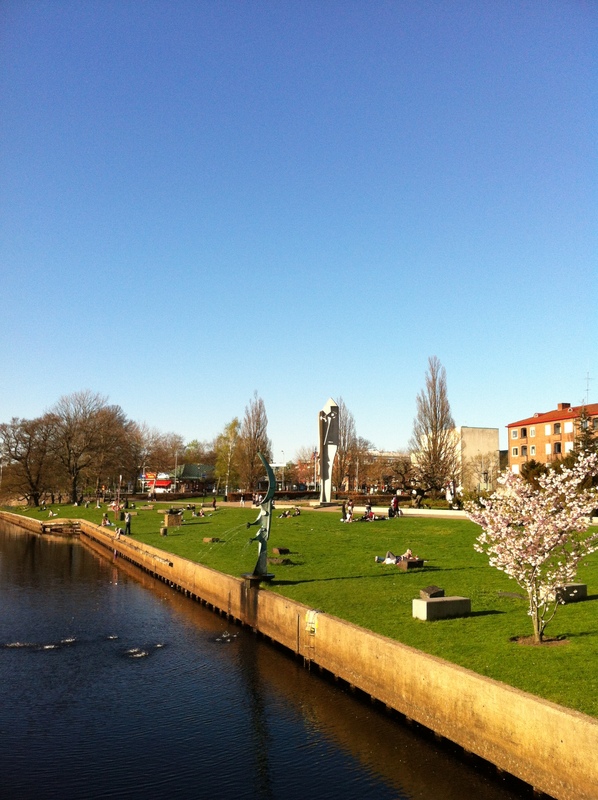 When Spring begins to peek out of hiding Sweden starts waking up from its many months of slumber. 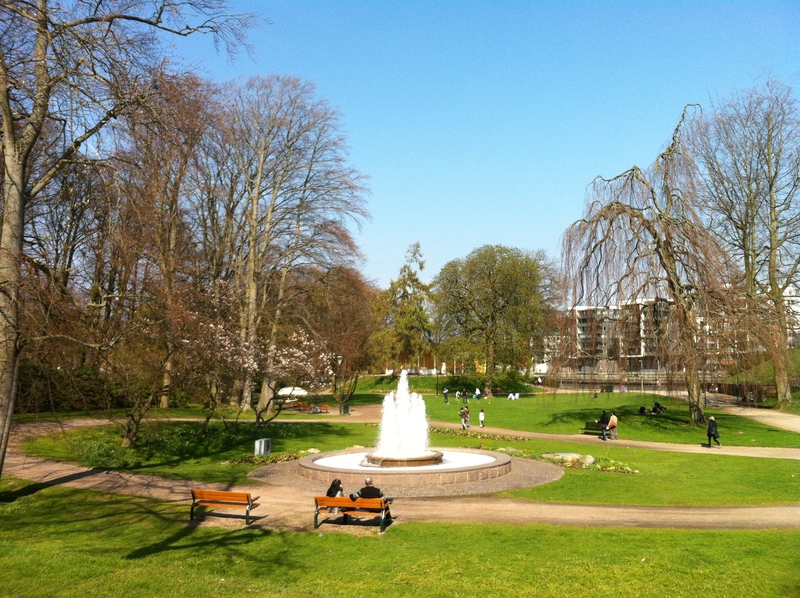 A few weeks ago Spring had sprung and even showed a glorious preview of summer. The streets were crowded, the parks were sprawling with sunbathers, the ice cream and gelato trucks were out, people were grilling and picnicking. It was a week of bliss. 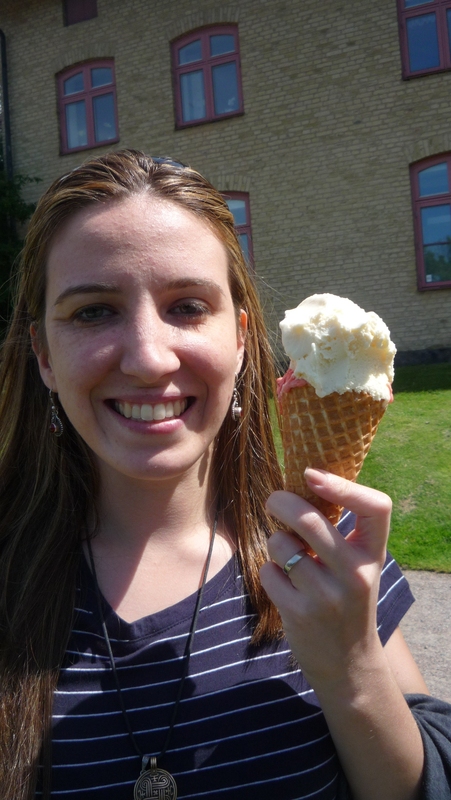 A week of exactly what makes Sweden tick. 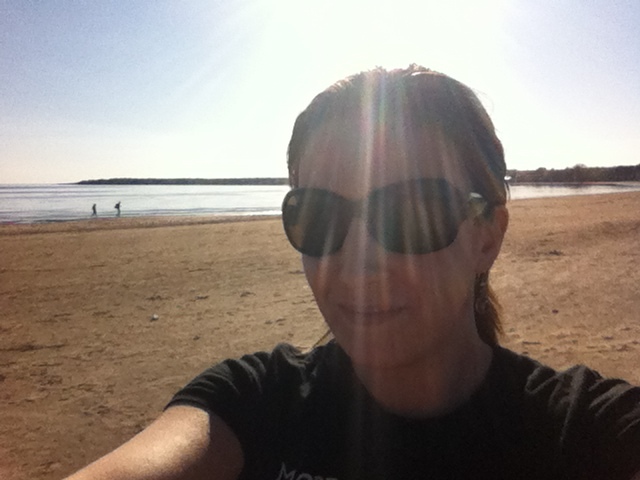 It’s an amazing feeling to finally feel the warm sun on your skin after months of dark and cold. It was. WAS. For the past two weeks temperatures have fallen and the sun went back into hiding. It has been raining almost everyday, cloudy, or windy. This type of unpredictable, ever changing weather is common in April, but I was hoping not so much in May! At least we now have 15 hours of daylight (Even if it is filled with clouds) and the temperatures are usually above 10 degrees Celsius (in the 50’s F. The hottest it usually gets in Southern Sweden is around 80 degrees Fahrenheit, which I think is perfect!) The sun makes a guest appearance a few times a day, but never long enough to be considered a “nice day.” There was one beautiful day in the past two weeks and it is supposed to start looking better on Friday (A little cloudy but no rain). It feels like One day forward, three days backwards these days. I’m beginning to understand why Swedes are so quick to jump in the sunlight as soon as it appears – it might not last very long! EDIT: Mother nature most have read my post because that 80% rain forecast turned out to be a pretty nice day! Some clouds and wind, but mild. We even played tennis. 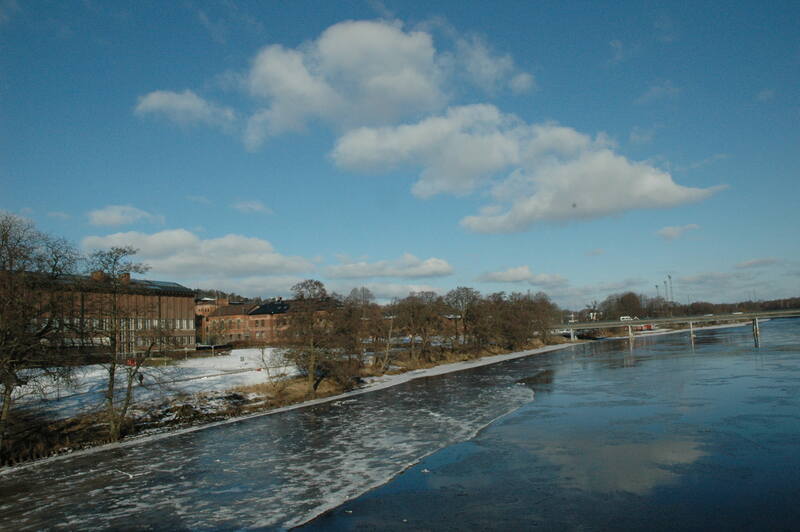 Categories: Sweden | Tags: Climate, spring, Summer, Sweden, Travel, weather, Winter | Permalink. We’ve been noticing a hint of Spring in the air the last three or four days. The temperatures aren’t as frigid, the wind isn’t slapping us in the face as hard, and you can actually feel the warmth of the sun caressing your check. 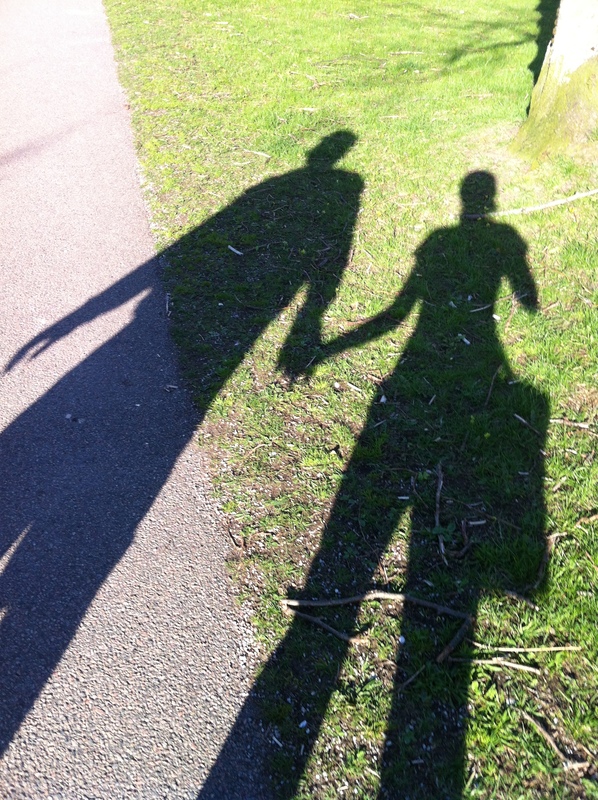 Hubby and I went for a walk yesterday, the plan was to show me how to get to my SFI classes and see how long the walk takes (straight forward 15 minute walk). Afterwards we planned on continuing our walk to the beach and take some photos. The ground was wet and the wind was a bit too chilly so we decided to skip the beach, but it was a good thing we had the camera with us. 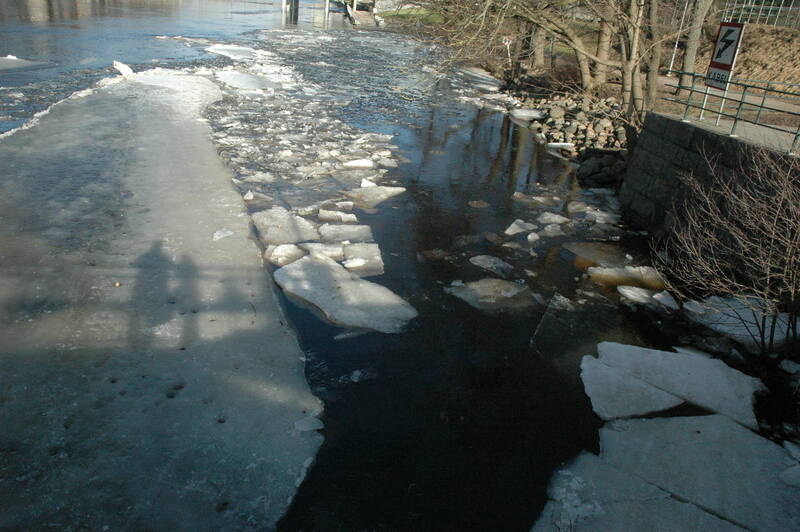 Just as we were arriving at the bridge to go to town we noticed that the ice on the river was melting. A true sign that spring is arriving – we are no longer experiencing freezing temperatures every single day, almost all the snow on the ground is gone (it’s been the same 4 inches of snow and ice lingering for 3 weeks now). I know that people usually consider the first sign of spring to be when they catch the first glimpse of flowers starting to bloom, to that I say that the vendors selling tulips in Stora Torg are also a delightful reminder. I dragged hubby closer to the water so I could take a few photos, turns out we arrived at the perfect time. 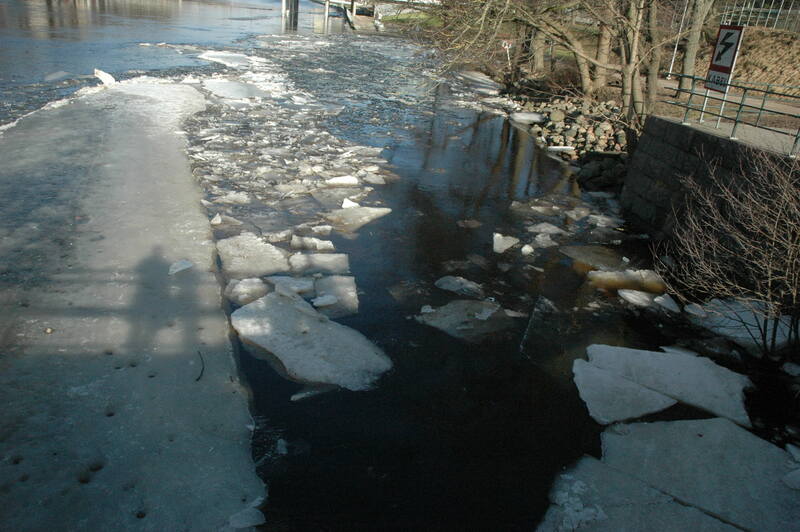 The last chunks of ice were drifting down stream, breaking in front of our eyes and before we knew it most of the ice was gone beneath the bridge. A few minutes later and we would have missed it. It wasn’t until afterwards that I realized I could have filmed all of this, but I think the stop and go captured it nicely. 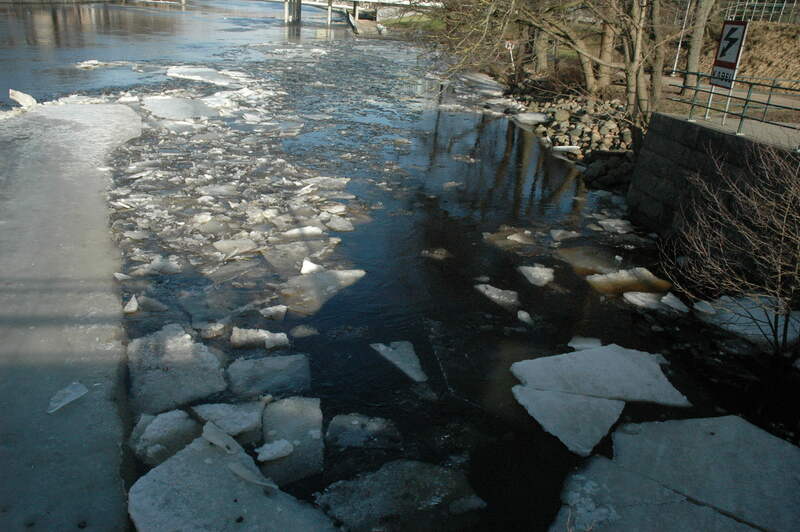 We crossed the bridge to find where all the ice had come to a halt, large chunks of ice building up and climbing on top of one another. 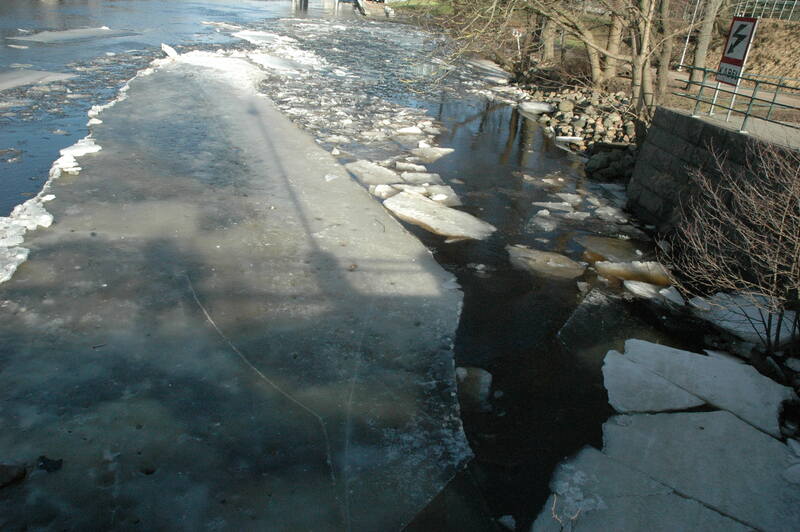 Two days afterwards and the ice is now all completely thawed. Out of sight, out of mind. It’s nice to go out without needing to bundle up. 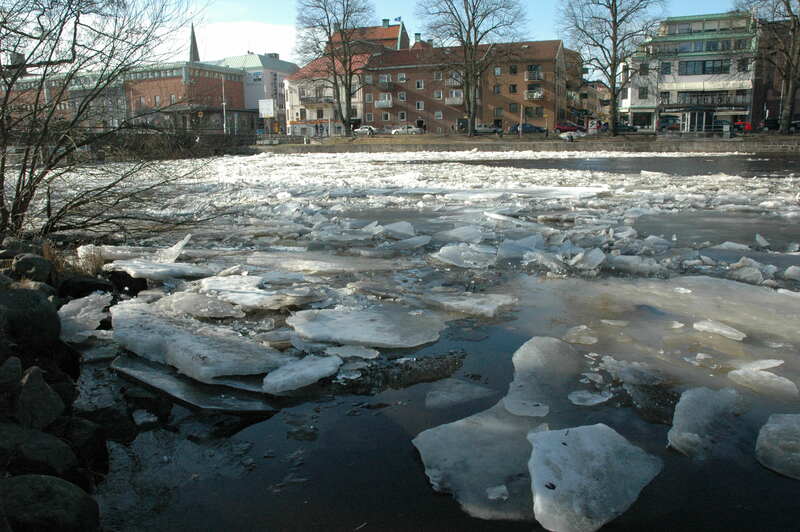 Categories: Photography, Sweden | Tags: melted ice, Photography, River, spring, Sun, Winter | Permalink. A relaxing post for a relaxing weekend. 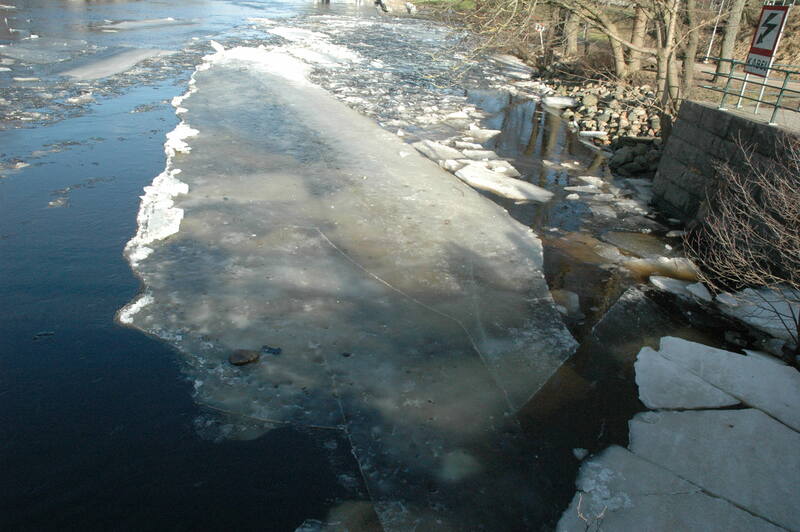 A few days after my photo exploration on Sunday I noticed that the local river has begun to freeze over. Too tempted by the blueness in the sky (instead of the drab gray skies that haunted my last photos) and the white ice where reflections were only days before, I took my camera for a second outing. 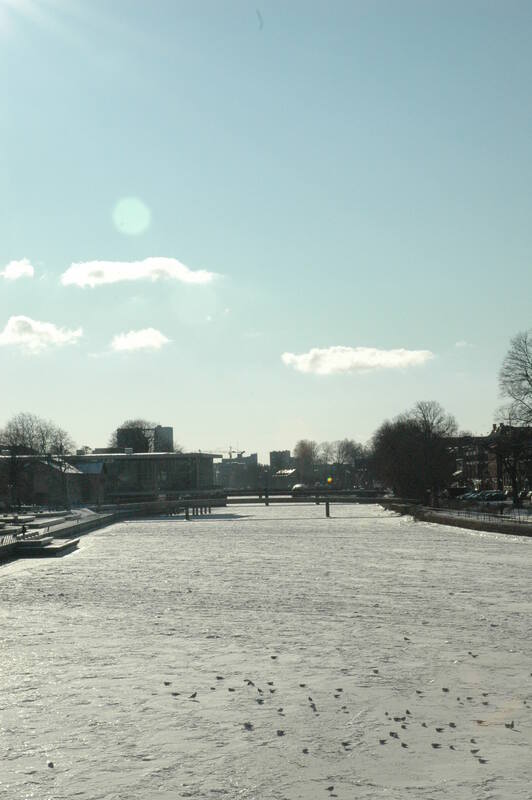 I felt well prepared as I had gloves this time around, however I hadn’t realized that the temperature plummeted from 27 to 16 degrees Fahrenheit (-2 to -8 C) (hence the icy river). 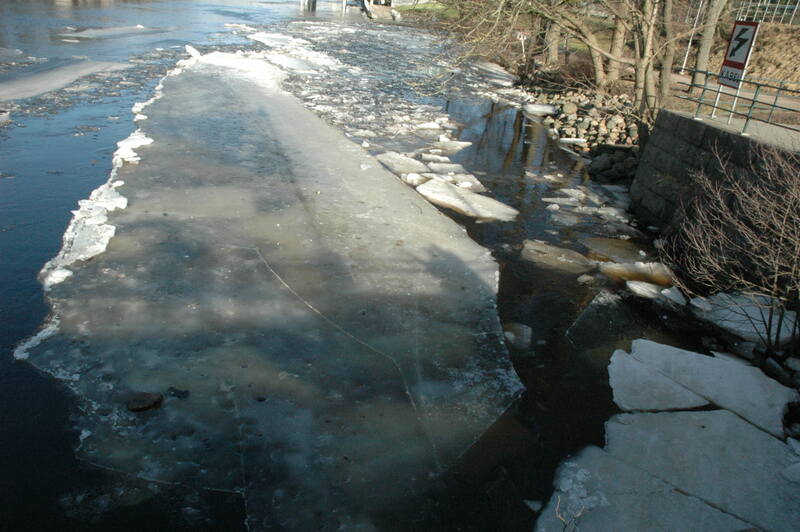 We walk past this river, along that bridge almost every day to go to town. 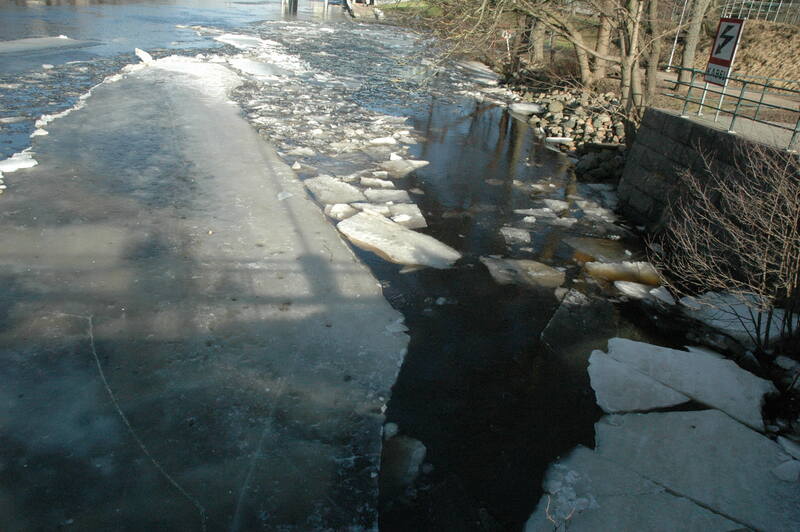 All the times I’ve walked up and down along the river it never occurred to me how dangerous it is! It is all open, with ladders every once in a while. Ladders and life rings. Very reassuring, especially when the ground is slippery and wet and icy. And especially when you can see footprints in the snow showing how close people walk to the edge. Doesn’t seem like it would take much to slip off. And then I saw this. 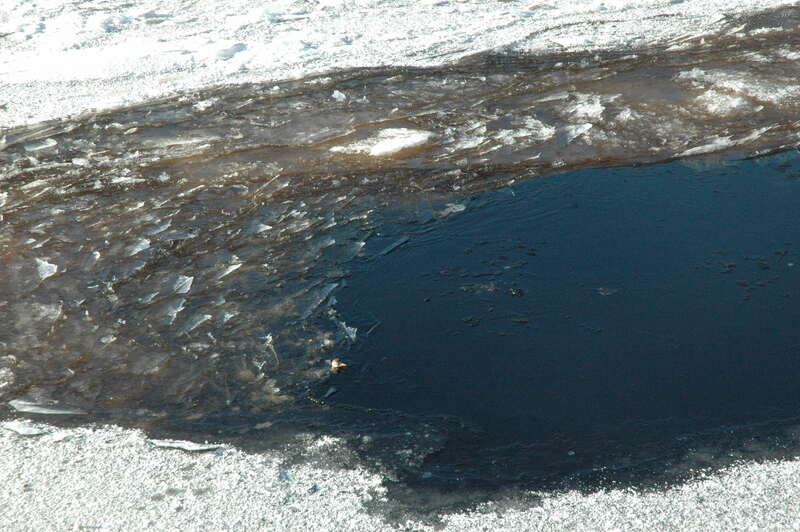 A hole in the ice…with a baby duck swimming around. Suddenly I became one of those foot prints closest to the edge, leaning on the railing, trying to get a photo of the duckling. 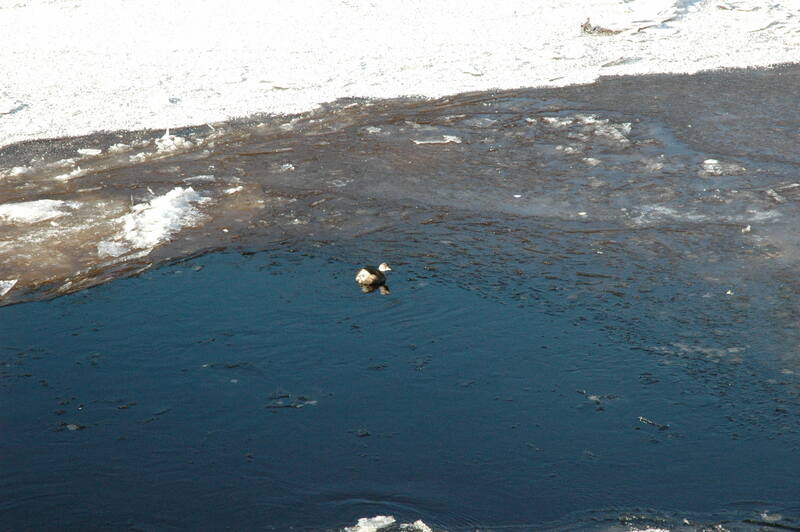 Do you see his tiny head peeking out from under the ice on the bottom left hand side? We played peek-a-boo and hide & seek for awhile. Every time I would move ever so slightly he would quickly retreat under the water with a splash and appear somewhere on the other side. 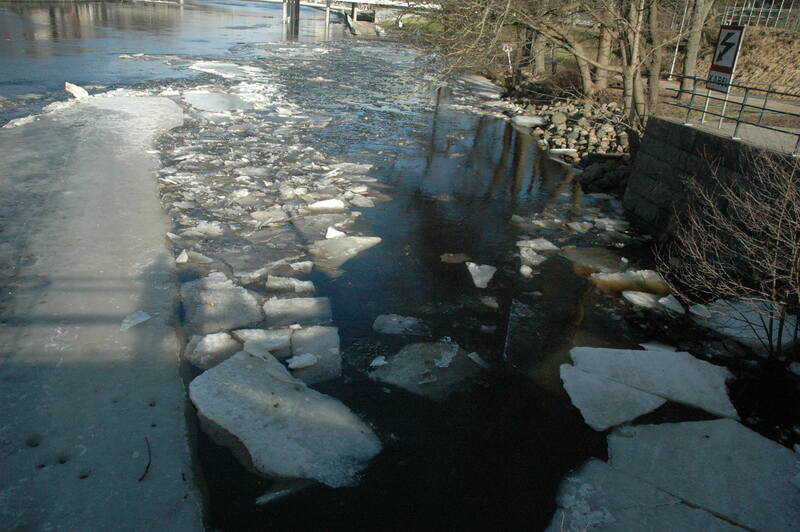 The ice goes as far as the next bridge upstream. 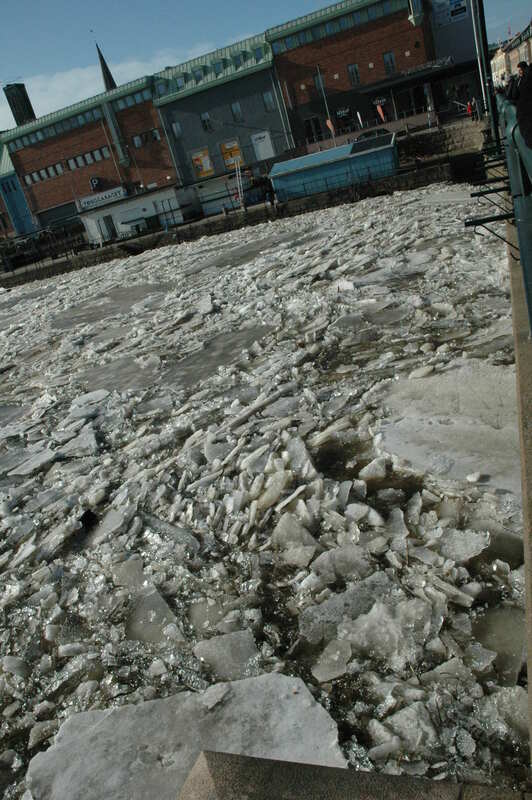 The gushing sound of the water rushing under the ice was relaxing. Onto the bridge for a better view. Lots of seagulls sitting atop the ice. On the other side of the red bridge it looks like another time and place. Blue skies and blue water. 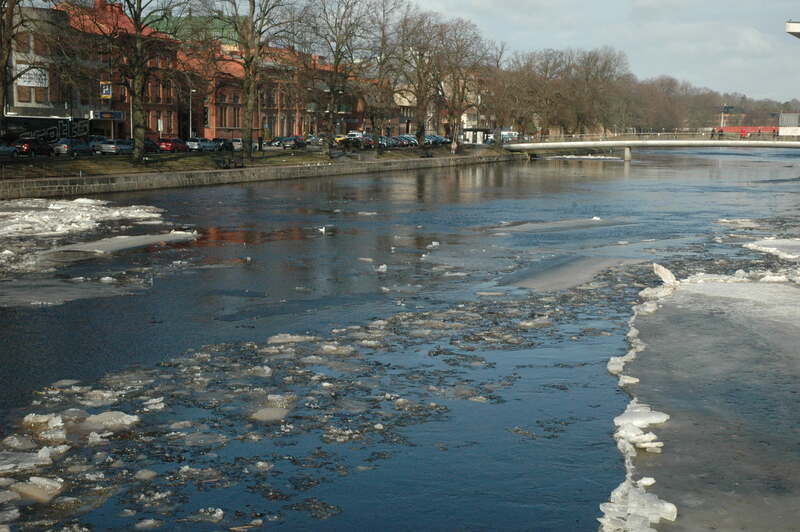 Categories: Photography, Sweden, Travel | Tags: Photography, River, Weekend, Winter | Permalink.